I first saw the orange kookaburra about three weeks ago but was unable to get any pic's however since then I have got lot's and there are two birds and yesterday I saw an older bird in the same area that has a similar colour, now I know what everyone will say, they are dirty or stained funny the parent bird I have seen isn't, and we have had enough rain to make the Jackson 4 look like Michael and the birds are still orange.I will post some pic's when I work out how, if anybody wants a pic email me. Wow.Very cool Honey. Thanks for posting.What area are you in, i'd love to see them myself? I'm in Cairns, unfortunately I think the closest bird may have died it was the smaller of the two and I have not seen it for about a week,the other one seems to be going from strength to strength and I see it a couple of times each day when I am home. Can anyone explain this phenomenon? Have they flown into a vat of decking stain? Is this a natural colour? Unfotunately I won't be getting to Cairns for quite a while so I guess I will have to keep an eye on here for updates, and just be happy with the normal ones in my yard. Thanks again for posting. Just an update the one remaining bird flew over me at about 1800 hrs ( real time, not fairytale time ) tonight and the front plumage looks to be getting a little darker and more solid . 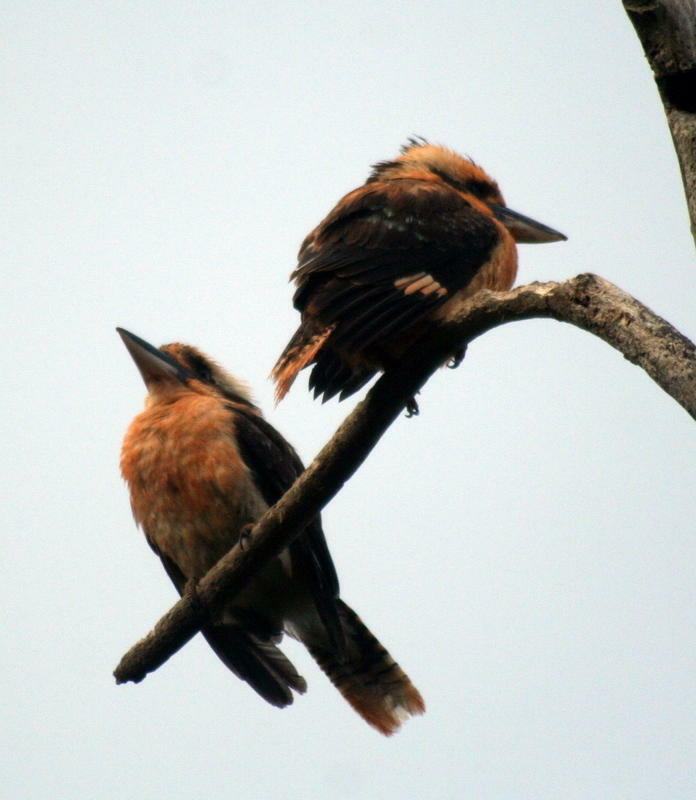 Hi Honey, we just spotted an Orange Kookaburra (01/01/18) near Murwillumbah NSW. There doesn't seem to be many sightings of them! We took plenty of pics and will upload soon.